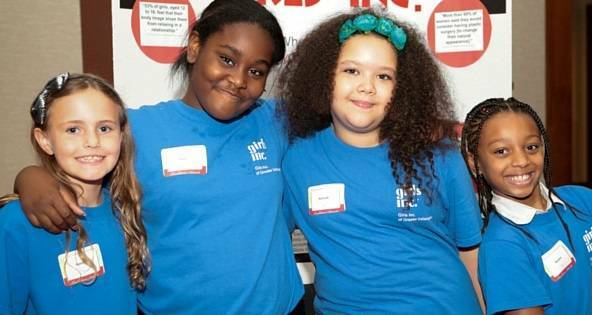 Girls Inc. of Greater Indianapolis is proud to deliver hands-on programs that empower girls to be confident in their own skin, prepared for their futures, proud of who they are, and ready to take their place in the world. Girls Inc. has been serving girls in the Indianapolis community since 1969. Until 2007, we operated two centers that limited the number of girls we could serve to 600. We boldly changed course, closed the two centers, and pursued an outreach-based program delivery method that has greatly increased the number of girls we serve and the long-term impact we make. During 2015, we served 3,709 girls through 6,963 program enrollments, the difference in numbers representing the many girls who benefit from multiple Girls Inc. programs. We offered 407 programs that inspire girls to be strong, smart, and bold. We operate on an outreach model of service delivery. We work with local schools and community organizations to bring our programs to neighborhoods where girls live or attend school. Our partners provide program space and register girl participants, while we provide our high-quality curricula and trained program facilitators who deliver it. We collaborate with nearly 100 community partners, including 80 schools in Marion and Hendricks counties in Indiana. “There are moments in your life that define you as a person. These times often happen when you least expect them to happen or when you do not even realize they are happening. As important is these moments are, the moments that happen in between are just as important. Every girl deserves to be congratulated after a big win at their soccer game, or after making the honor roll, but more importantly girls need to feel just as empowered when they make second place in the spelling bee or do not get into every college to which they applied. Girls Inc. programs teach the soft skills that empower girls to focus on education by reducing classroom disruptions, advancing positive attitudes toward learning, encouraging constructive interpersonal communications, and improving self-confidence in their academic abilities. Each of these skills allows girls to manage themselves and their relationships with their teachers and peers, and make education the primary focus of their time spent in school. Our programs encourage girls to build purposeful, personally fulfilling lives that strengthen the communities in which they live. Girls are more likely to take charge of their personal health and have a sound body image. Girls are also more motivated to graduate from high school, attain post-secondary education or training, and strengthen the workforce. This is the power of Girls Inc. programming. Girls Inc. of Greater Indianapolis Alumna Jourdann takes on the job of role model with natural grace and dignity. She is an inspiration to younger girls in our program. The girls all look up to her. She is strong, smart, and bold!